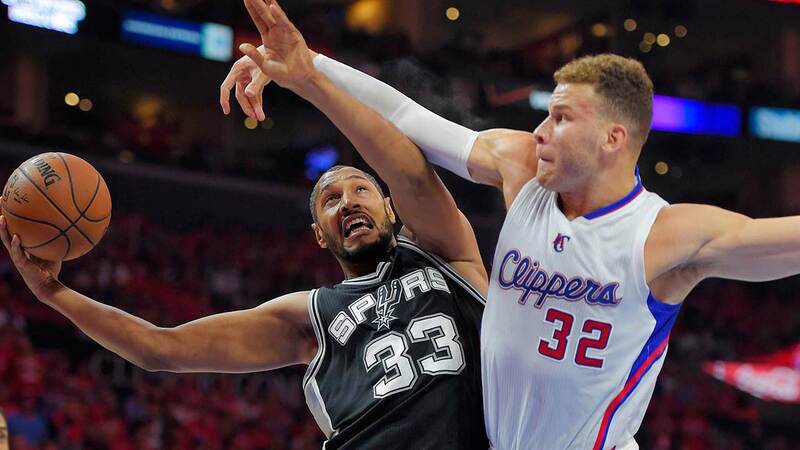 LOS ANGELES, CA -- It figured that the most entertaining first-round series in the NBA playoffs would come down to a play involving Chris Paul and Tim Duncan. Paul, who willed himself back from an early hamstring injury, banked in a shot over Duncan with a second left to lift the Los Angeles Clippers to a wild 111-109 victory in Game 7 on Saturday night that eliminated the defending NBA champion San Antonio Spurs from the playoffs. After Duncan made two free throws to tie it with 8.8 seconds left, Paul drove the right side. He originally was covered by Danny Green before Duncan came over to help. Paul put up a one-handed shot over the 39-year Spurs star that went in as he was falling away. Paul said coach Doc Rivers called him and Blake Griffin over at the end of the morning walk-through to talk about last-shot scenarios. "We've been in that situation a lot of times already this year, and most of the time I hadn't made it," Paul said. "We talked about it, and finally it worked when we needed it." Rivers said Paul is "just a tough kid. He's a street fighter. I mean, he really is. I love him to death because of his will." Duncan said Paul's shot was "just unbelievable. I know he was playing a little hurt, and he played through all that, found ways to get it done. I mean, just an unbelievable last shot over two of us. He's just a great leader, and it was amazing to watch. I wish I wasn't on the other end." The Clippers, who faltered at home in Games 2 and 5, move on to face the Rockets starting Monday night in Houston. "It's only round one, but that team over there, I mean, it's crazy that this was the first round of the playoffs," Paul said. Paul scored 18 of his 27 points in the second half, including four big 3-pointers. Duncan had 27 points and 11 rebounds, his sixth double-double of the series. Paul missed the final 2 minutes of the first quarter and the first 5 1/2 minutes of the second quarter. He appeared to get hurt as he dribbled up court before making a 3-pointer. He sat on the bench with his head in his hands before leaving for the locker room. "I thought about the team and all the things we'd been through," Paul said. "I know that if it was any other guy on our team in a situation like this, they wouldn't lay down, so I just tried to find a way." Blake Griffin had 24 points, 13 rebounds and 10 assists for Los Angeles for his second triple-double of the series. The Clippers trailed by five points with 5:42 left before Griffin made two free throws and J.J. Redick a 3-pointer to tie it at 97 with 3:58 to go. The teams traded leads during the final minutes, with Duncan, Kawhi Leonard and Manu Ginobili scoring for the Spurs and Barnes hitting a 3-pointer for the Clippers. Paul made two three throws with 13.3 seconds left for a 109-107 lead before Duncan was fouled by Redick and made both shots with 8.8 seconds left. Paul hit a clutch 3-pointer as the buzzer sounded at the end of the third quarter to give the Clippers a 79-78 lead and earn a standing ovation. It was his third 3 of the quarter, coming after Ginobili made two of three free throws after he was fouled by Austin Rivers while taking a desperation shot from three-quarters court with 7.8 seconds left. Barnes scored 17 points, Jamal Crawford 16 and Redick 14 for L.A.
Tony Parker had 20, Danny Green 16, Leonard 13 and Boris Diaw 12 for San Antonio. Spurs: The five-time NBA champions are 3-3 in Game 7s under coach Gregg Popovich, including 1-2 on the road. Clippers: The first person Paul greeted after the win was actor Billy Crystal, a long-time Clippers season-ticket holder. "Me and Billy have actually gotten really close since I got here," Paul said.